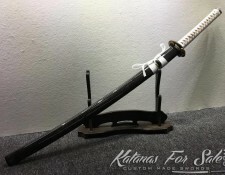 We are proud to offer you the largest selection of Samurai swords for sale, including Katana swords, Wakizashi swords, Tanto blades, long blade Nodachi, Shirsaya, Ninjato and a lot more. 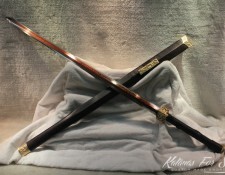 Our swords are made of quality materials with wide selection of customization options. 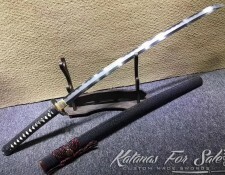 Our specialty is Samurai swords, with focus on custom Katana swords and other Japanese weapons, each sword we make is handmade with care, followed by traditional Japanese methods of sword making and according to your preference of quality materials. We invite you to dive into our website and bookmark it, as well as join our large family of sword collectors and Japanese blade enthusiasts. 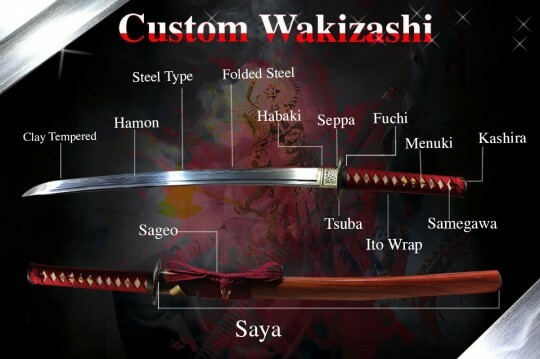 If you are thinking about designing your own custom swords, you can go ahead and see our selection of custom Samurai swords here. 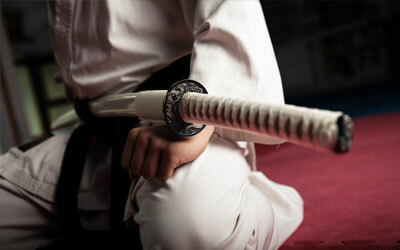 Sharp and exceptionally tough these are just two of the qualities that the Katana sword is best known for. The Katana is a curved and single edged blade used by the Samurai warriors. The Samurai used to carry the Katana sword when paired with a Tanto or Wakizashi. These are the primary weapons you carry if you were a member of the Japanese warrior class in Feudal Japan. 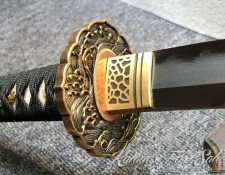 History shows that the blade smiting process developed in Japan have resulted in the unique forging of these Nihonto swords, Japanese blades are forged with different profiles, blades and thicknesses. 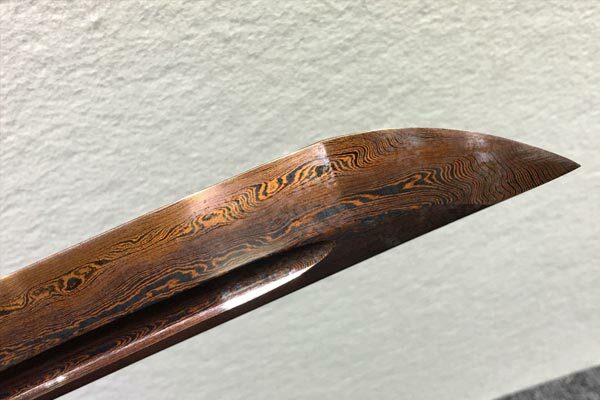 Due to the low quality iron available in Japan in that era of time, the Japanese sword makers have been refining the steel, by folding it time after time, removing the impurities and creating thousands of layers, which resulted in beautiful Hada (grain pattern) on the blade. 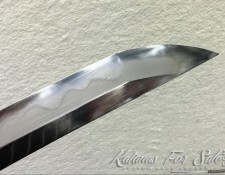 Furthermore, traditional Japanese blades are going through the differential hardening process, which involves clay coating and tempering of the blade, this allows the edge to become very hard and keep its sharp edge, while the spine is left softer, and allows for the Katana sword more flexibility and making it more durable, so the sword will bend and not break. The Katana sword has the right amount of curve to allow the force of the blow to concentrate on a small part of the blade. 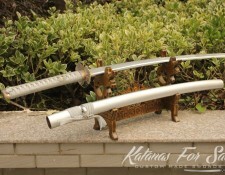 Our handmade Katana swords are full tang and can be made of several steel types of your choice. 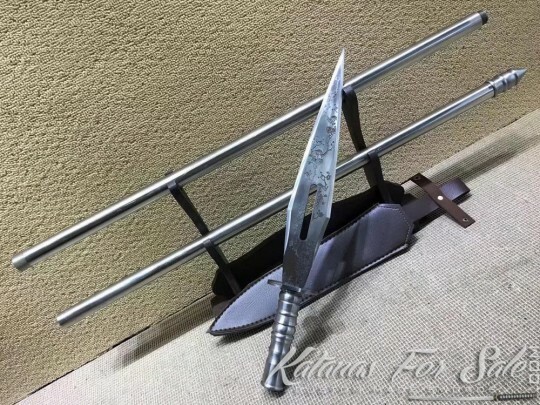 Real swords are made of carbon steel, and no matter which carbon steel Katana you will choose from our site, the sword will be well made, fully functional and capable of test cutting. 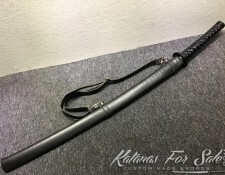 Whether you are a sword collector or a martial art practitioner, if you are looking for a custom made battle ready Katana that is a lot more than just a decorative piece, you have come to the right place. Also if you are considering to buy it as gifts for men or as your groomsmen gifts, you certainly choosing unique, awesome and meaningful gift. 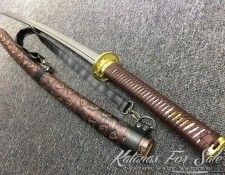 At Katanasforsale.com you can find all kinds of samurai swords for sale that are both functional and battle ready. These custom swords are more than just awesome backyard cutters, for the Samurai warrior, they are inseparable from the soul. 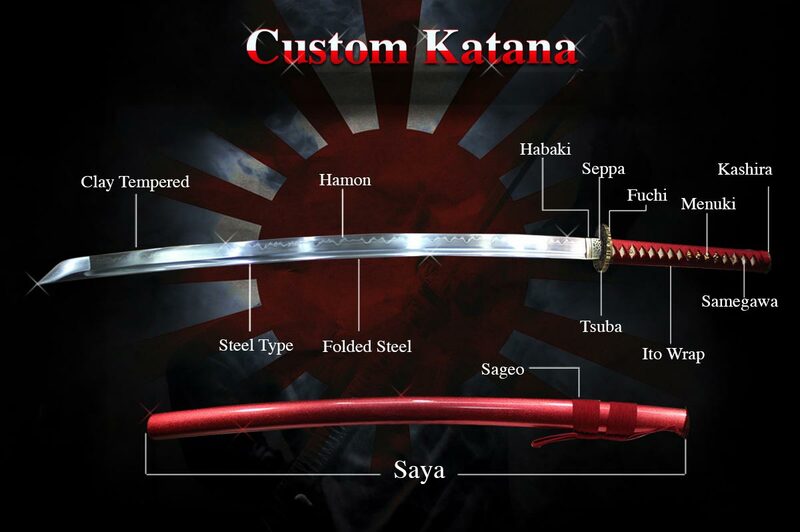 The swords are made of high carbon steel content which becomes a work of art and a deadly beauty. 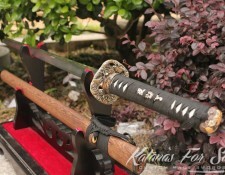 You can expect fine craftsmanship of hand forged Samurai swords using traditional methods. You are guaranteed that all of our Samurai swords for sale are full tang and are made by hand as per your specifications. 1060 carbon steel is the most basic steel we offer, it can be folded to display the Hada, and considered as our entry level Samurai swords. 9260 Spring steel is modern steel that is known for it’s incredible flexibility, it is very durable and has high shock absorption. 1095 carbon steel is very hard steel that produce a extremely tough blade, we highly recommend to Clay temper the steel for maximum efficiency. T10 tool steel is considered as one of the best steel you can choose, it is very hard, capable and durable and has more resistant to scratches. 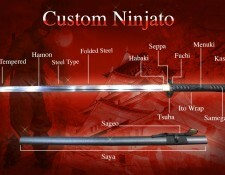 To ensure that you will get the custom Katana sword you desire. We offer the folding process for all of our steel options. 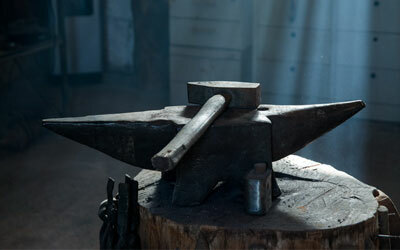 The blade will be folded 13 times, which will create 8192 layers of steel and will display beautifully on your sword. For 1095 carbon steel and T10 tool steel we highly recommend traditional clay tempering. This will result in authentic hamon of your choice and a fully capable and durable blade that can be used for Tameshigiri and backyard cutting. 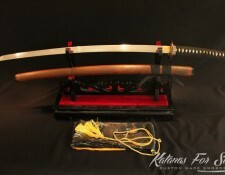 Authentic customized Samurai swords from Japan referred to as Nihonto usually carry a very high price tag. At the end of the day, it is usually close to impossible to buy Nihonto unless you are ready to spend thousands. 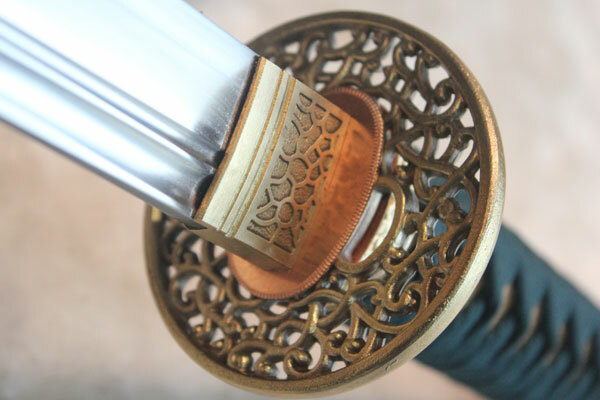 The prices offered at our website vary, depending on the quality of your sword, the steel, overall appearance, fittings, materials, parts, and further enhancements you have chosen. 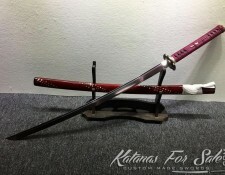 At Katanas for sale shop you can decide your budget and filter swords only in that price range, or you can make your custom made blade and choose components that fit your budget. 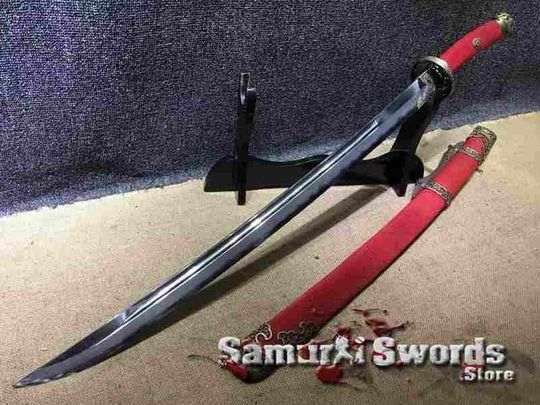 "Not All Swords Are Created Equal"
There is overwhelming majority of cheap Japanese style blades sold online from different vendors, some sell swords that are sharp, however, it is not the sharpness alone that makes the blade, a blade. One must be careful if he is looking for a higher quality sword than the average nice looking decorative Samurai sword set that you can display over the mantelpiece. 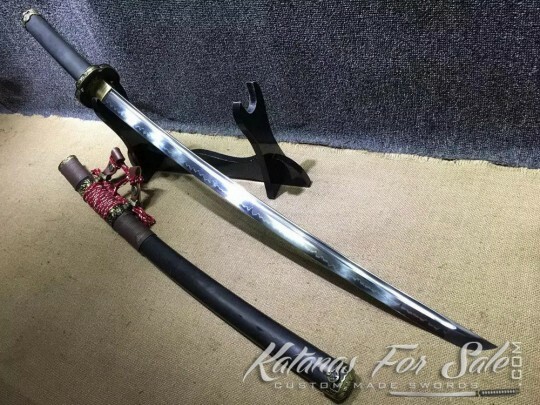 There is really nothing wrong with that (or some will say there is), however if you are looking for something better, stronger, made according to your specifications and with high attention to details, then there are swords like our Samurai Katana swords. All of our swords are full tang and can be sharpened to perfection. We offer large selection of clay tempered blades with amazing quality materials, for frequent Dojo use and fully capable of Tameshigiri and test cutting. 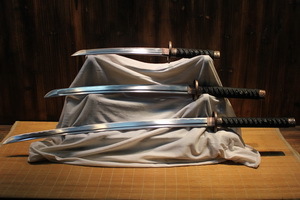 Each Katana is handmade and hand sharpened, the swords are well balanced, flexible and will feel good in your hands. 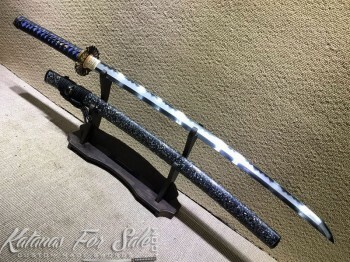 If you dream of owning a personalized black blade Katana Samurai sword of your own, polished and with Choji Hamon according to your preference and taste, that is exactly what you will get. It is a true fact that most of our clients simply can’t get enough! 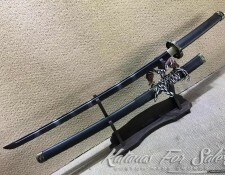 It is how great the make your own custom Katana section of the site is. Which Sword You Should Get? Here is a simple guide on what to look for in a Katana. Learn what the different properties of steel are, and which one will suit your needs from the list available. When you customize your Katana blade remember that different steel allows for different options of Hamon, polishing and blade coloring. Katana swords made in the early part of the Muromachi period were worn blade up. This covers 1392 until 1573. Due to the changing style and need for the ultimate weapon. Sword with a blade longer than 60.6 cm was considered to be a Katana. 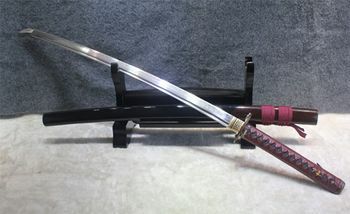 Sword fights in movies tend to be dramatically slow to give emphasis to the action however, in real life, a duel using real Samurai swords can be over in an instant, just like that. Especially since these Japanese swords were extremely sharp and was made to cut flesh easily. It is often praised as the finest cutting weapon in military history of the world. The Katana sword has a distinctive appearance with a curved single-edged blade with either a circular or square guard (tsuba). It has a long grip that allows to hold the sword with both hands. The evolution of the Japanese Katana came from the Tachi sword yet the primary difference between them was that the Tachi was worn with the cutting edge down while the Katana was worn with the cutting edge up. Due to the changing nature of Japanese close combat warfare it is not surprising that the Katana has grown in popularity among the Samurai. Since this sword can be quickly drawn and attack, it is compatible for combat use. As a result, response time is faster. 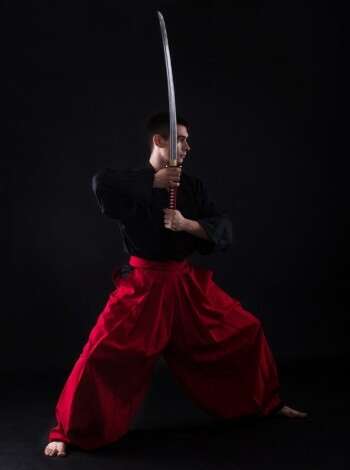 The Katana sword is worn through a belt like sash or Obi. Mostly paired with a Wakizashi sword and at times with a Tanto. 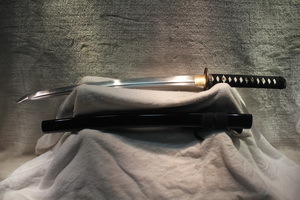 Wearing the Katana and Wakizashi is referred to as Daisho. Only samurai were allowed to wear the Daisho because it represents their social status, power and honor. How to Start Building Your Custom Swords? 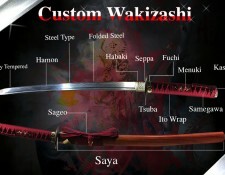 Ordering your personalized handmade custom Samurai swords or Ninja swords is quite simple. First you should select what kind of blade you want. 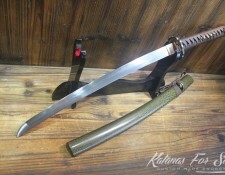 We offer large selection of Japanese weapons for customization, each with his own unique parts and options. 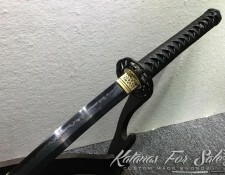 One of the most popular choices is the carbon steel Katana and Wakizashi, yet there are many other sword designs that you can add to your collection. 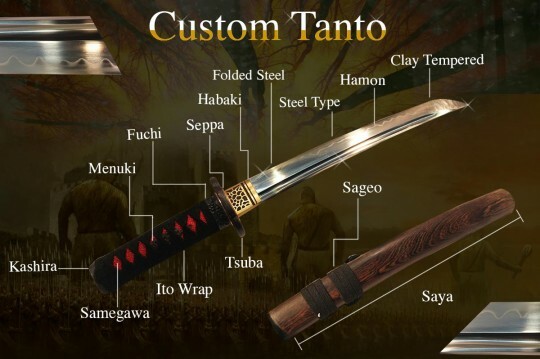 For your convenience, here is a list of customized Japanese blades with a short introduction about each weapon. The Samurai Katana sword was the primary weapon worn by the Samurai, it features a single edge curved blade with hand guard, the blade measures over 60.6 centimeters and the handle is large enough to accommodate both hands. The Wakizashi sword was the companion of the Katana, Only Samurai could wear the Katana and Wakizashi together as Daisho. The Wakizashi acted as a backup sword, in close quarters, and for the ritualistic suicide called Seppuku. 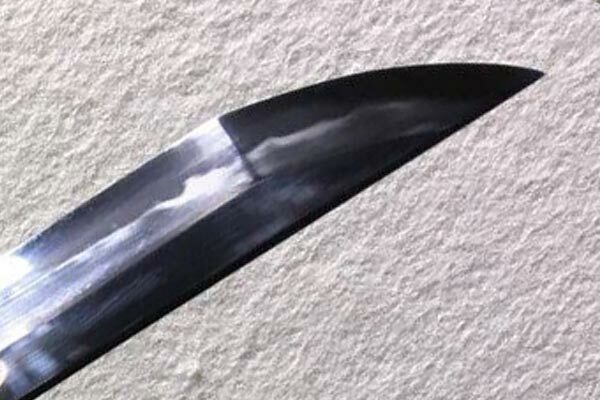 The Japanese Tanto is a short blade which was mostly used in close quarters combat, the Tanto proved to be very efficient in penetrating armor up close. 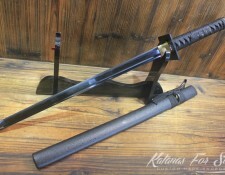 At times the Tanto was paired together with the Tachi or the Katana. 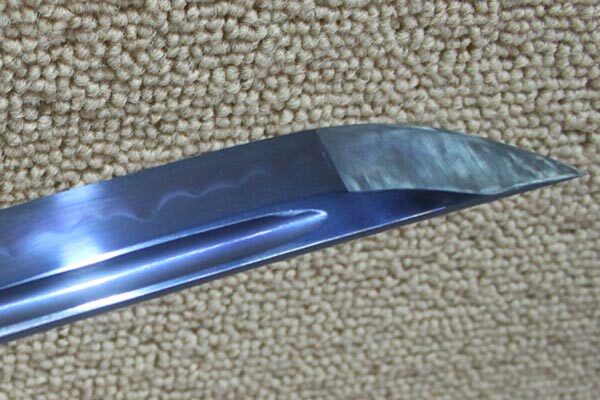 The Nagamaki is one of the least known blades used by the Samurai, yet it is considered as one of the traditional Nihonto Japanese blades. 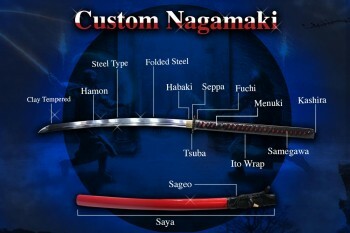 The Nagamaki features a very long handle with a blade size of a Katana, and allows for more power and reach. 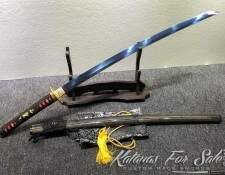 The Nodachi sword has a very long blade, to qualify as a Nodachi the blades should measure at least 90cm, this great field sword was designed for war in open battles, it was mostly carried by foot soldiers, and said to be able to cut down man and his horse in single hit. Shirasaya swords are Japanese blade mounts that can accommodate any size of blade, commonly in Katana, Wakizashi and Tanto size, with a straight or curved blade. 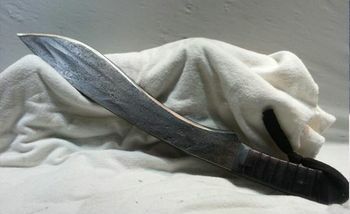 The Shirasaya is made of wood. Its simple and elegant style makes it loved by many serious collectors. The Shinobi of Feudal Japan also known as Ninja used to have their own Ninjato swords which often were made from slabs of iron, they featured a straight blade instead of a curved one. Ninja swords were efficient in their owner’s skilled hands. 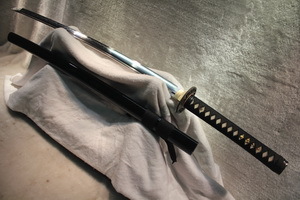 Our most basic steel is the 1060 carbon which is considered as our entry level Samurai swords. 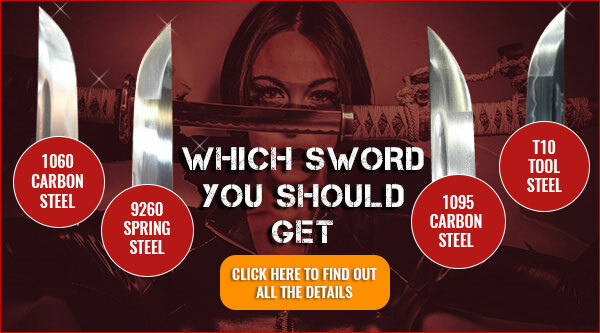 If you plan to use your custom sword for cutting exercises, the best steel you can get is a clay tempered blade either made of 1095 carbon steel or T10 tool steel. Both are quite similar however, the T10 contains tungsten properties which makes it more tough and resistant to scratches. Another modern steel we offer is the 9260 Spring steel which has silicon added to it, which results in a significant increase in fatigue resistance and allow for maximum flexibility. These are highly durable and for most dojo applications they are extremely resistant to bending and failures. Each one of the steel above will create a blade that is fully functional and battle ready, and can be used for test cutting. 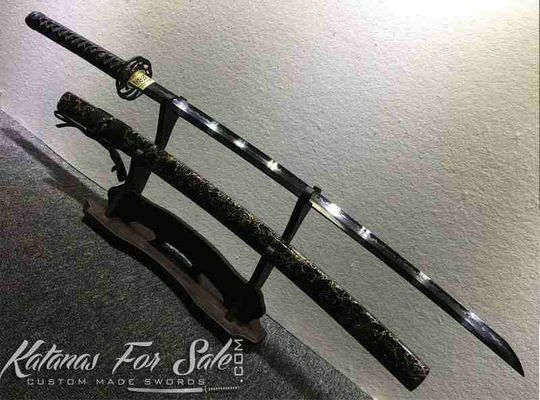 Since all of our swords for sale are handmade, you can expect to get what you ordered, and with the exact customization you requested. 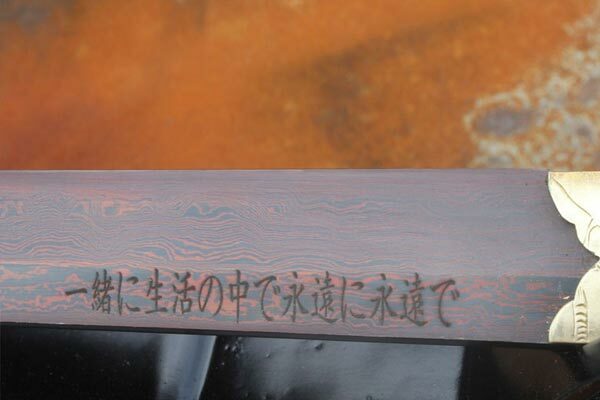 In the production process of our Samurai swords we give attention to the small details. We treat each blade personally, so you can be assured your Samurai Katana is not just an ordinary sword, but a work of art. 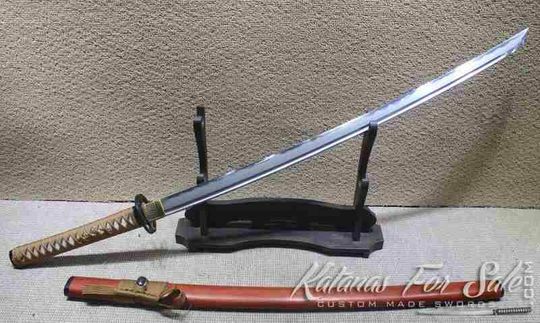 You can be confident that when our custom swords for sale are finally made, it will be at par with your expectations and even exceed them. We welcome you into Katanasforsale website and hope you can find anything you needed. 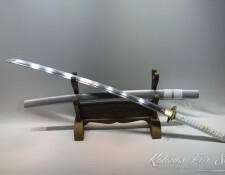 Looking forward to provide you with your awesome new Samurai sword. 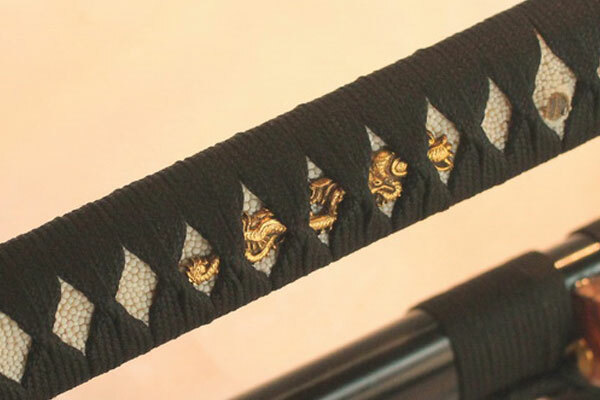 The Tachi is among the traditional Japanese swords or nihonto worn by the Samurai during feudal Japan. The Tachi sword was very efficient by the use of cavalry. later it evolved into the Samurai Katana. 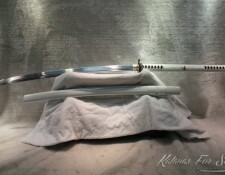 Unlike the katana, which was worn with the cutting edge up, the tachi was worn with its cutting edge down. The Tachi’s average blade length is between 70 and 80 centimeters. It is more curved than the katana. and has a greater taper from handle to point. The production and use of the dao sword date back to the Shang Dynasty (between 1600 BC and 1046 BC). Its earliest form is called zhibeidao. While most dao swords were made of steel or iron, the earliest dao was made of bronze. Because of its sturdiness, ease of use, and great chopping ability. The Dao became popular as cavalry weapon during the Han dynasty. 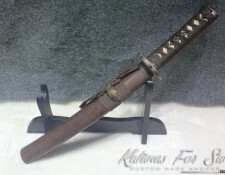 When it started to be issued to infantry, the dao replaced the jian as a standard-issue weapon. Dao produced during the late Han dynasty had length that ranges between 85 and 114 centimeters. 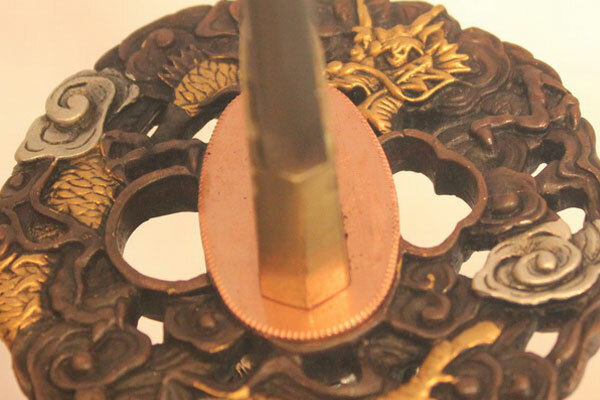 The jian is a straight, double-edged sword used by the Chinese during the last 2,500 years. According to some of the first Chinese sources, the jian dates back to the 7th century BCE, during the so-called Spring and Autumn period. The Jian sword was originally made of bronze, when metal technologies advanced they were bein produced from steel. The Sword of Goujian is one of the earliest jian swords. 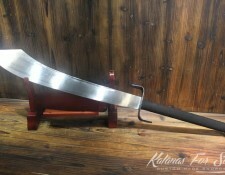 The jian’s average weight is between 700 and 900 grams or between 1.5 and 2 pounds. Its usual blade length is 70 centimeters or 28 inches. One-handed versions of this sword have blade length that ranges between 45 and 80 centimeters or between 18 and 31 inches. 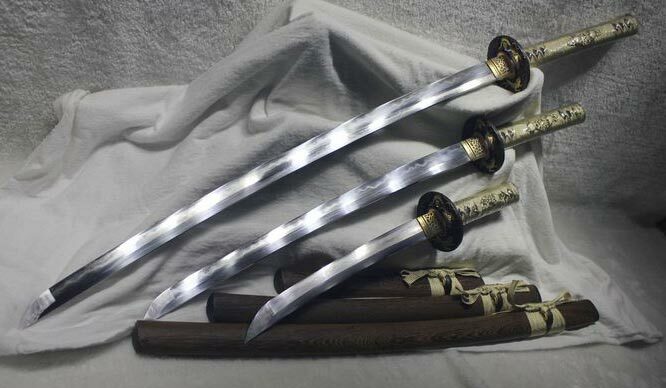 Two-handed versions of the Jian sword are used for different kinds of Chinese martial arts training. The Spear is one of the most ancient weapons ever used by humans, spears along history vary in style depending on the area they were made. we offer several types of spear for sale. Spears have been a vital weapon in large battles and the formation used were highly effective. It was one of the most common weapons used by infantry to block cavalry attacks. 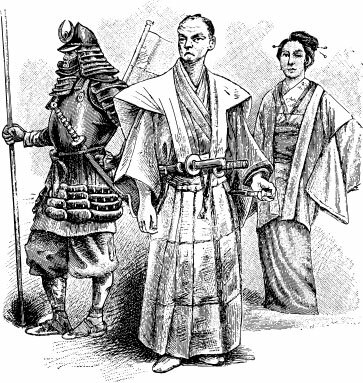 In Japan, one of the most common spears being used were the Yari and the Naginata, both have been favoured by the Samurai and Ashigaru infantries. 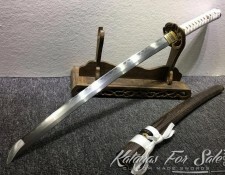 Samurai Katana sword is probably one of the best gifts for men. 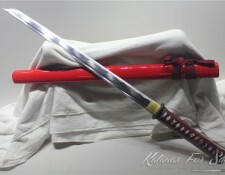 The Katana is made from many different parts, each one contributes to the sword full functionality and each one is important, it might be confusing at first to keep up with all the Japanese terms for every part of the sword. 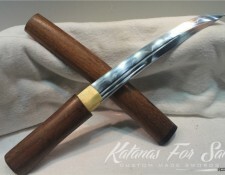 For any sword enthusiasts like you making the decision to choose full tang Katana is certainly a must. The term full tang means that the blade steel goes all the way through the entire handle and it’s made of one piece of solid steel. 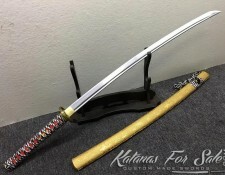 This allows the Katana for increased force leveraged through the handle against any resistance of the material cut by its blade. On most of our swords, the Tang is being held by 2 Mekugi pegs, on shorter blades like the Tanto we sometime use 1 Mekugi peg. All of our swords for sale are full Tang. 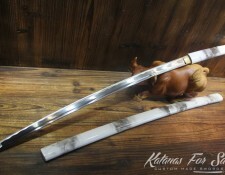 You probably heard about the folded steel Katana, or sometime referred to as Damascus steel Katana sword, During feudal Japan, the folding process was done to even out the impurities in the steel. Yet today with modern steel being used, the folding process is not necessary for the blade capabilities, it is being done for traditional and aesthetic purposes. When the steel is folded, each fold multiply the layers of the steel, which creates a subtle Hada, and results in a beautiful grain pattern on the blade. Yet it does not improve the cutting abilities of the blade. The folding has to be done properly and with utmost care, otherwise it can create air pockets between the layers, which will eventually result in blade failure. All of our swords and steel types can be ordered folded. Our standard is 13 folds, which creates 8192 layers of steel. 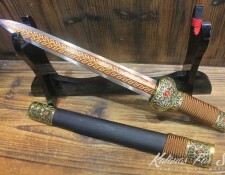 If you are looking for a traditional looking blade with folded pattern, then you can choose one of our folded steel Katana swords from your preferred type of steel at the custom sword pages. 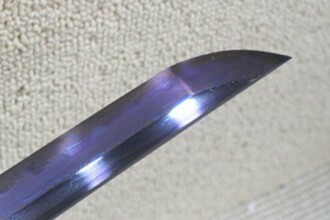 Clay tempered Katana is a sword that went through the differential hardening process, also known as clay tempering. 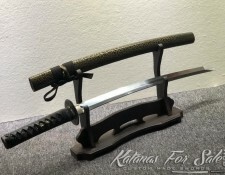 The main goal of the clay tempering process is to give the Katana a very hard edge that is stronger, more capable and durable, while at the same time keeping the spine of the sword softer and bendable. This help in making the clay tempered Katana very resistant to breaking, with extremely sharp and hard edge that is more resistant to wear. Clay is being used to cover the blade, yet the edge is left exposed, so when it is heated and quenched, the edge of the blade cools quickly and becoming very hard, while the rest of the blade takes longer to cool, and produce a softer steel. 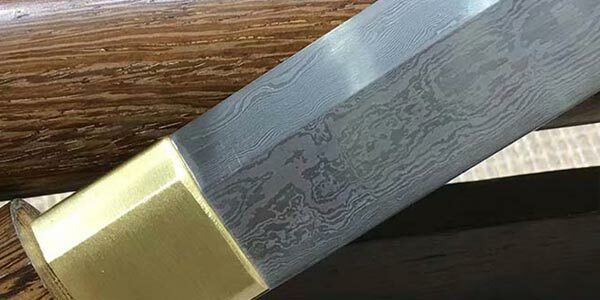 This also results in authentic Hamon line which can be seen on the Samurai Katana blade, different clay tempering techniques produce different Hamon patterns. 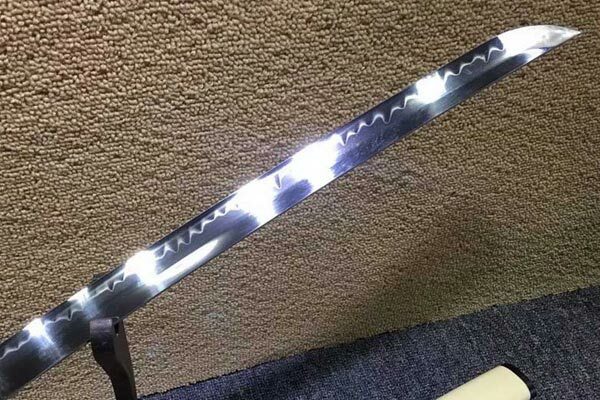 If you are looking for a clay tempered sword, You can choose between our 1095 carbon steel Katana and T10 Tool Steel Katana. 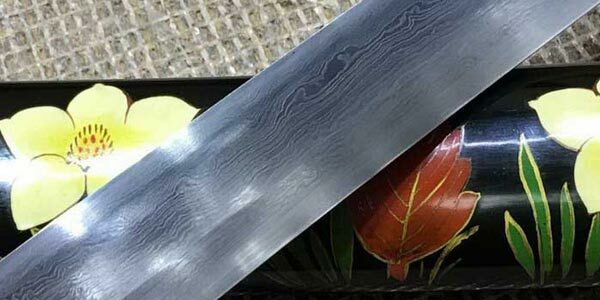 Those type of clay tempered blades are usually referred to as Battle ready Katana swords, as they can stand the rigours of test cutting and a real combat. 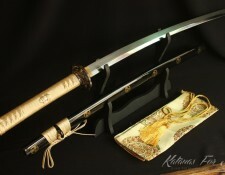 Apart from being a very sharp weapon, The Samurai Katana swords are works of art. During ancient days the Tsuba was also used to exhibits the swordsmen prosperity and stature. 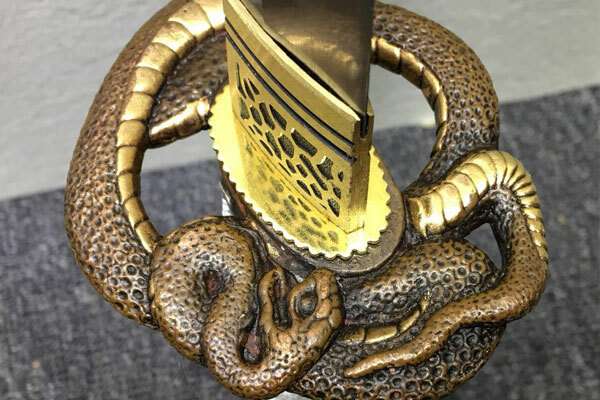 The Tsuba serves as guard around the handle of the sword. This keeps the sword in balance while it protects you from having your hand cut from the blade. There are instances when the Tsuba means the difference between your life and death because it blocks the incoming slash from your opponent’s sword. 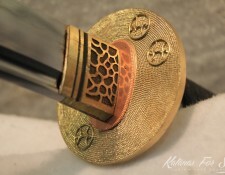 There are different Tsuba designs available made from different materials. We offer variety of Tsuba designs, made of metal alloy, brass, iron and copper. You can choose your preferred style for your sword hand guard. 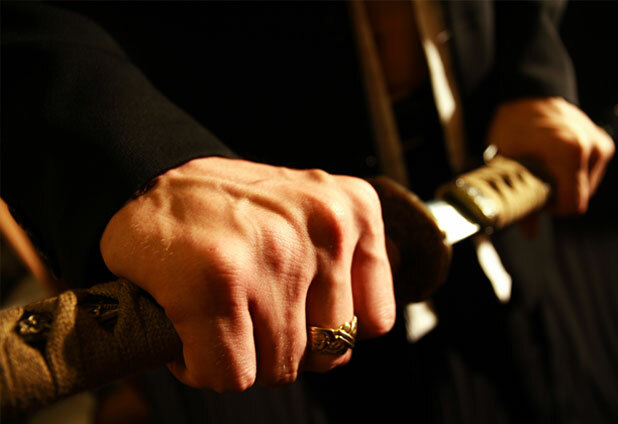 Fuchi Kashira are actually two words which refers to ornamental fittings attach to the hilt of the Japanese swords. 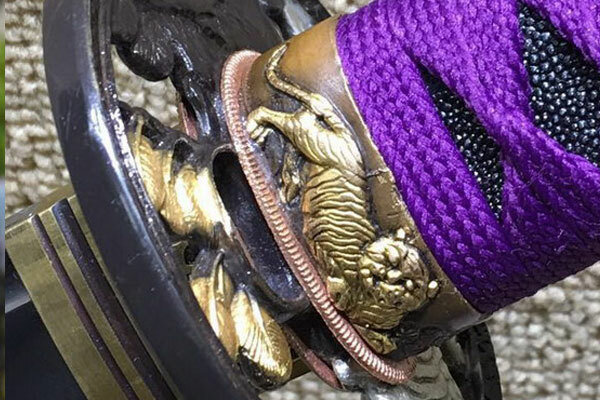 Fuchi is the Hilt collar while Kashira is the Pommel. The Kashira fits over the edge of the hilt and the Fuchi fits around the hilt close behind the Tsuba. 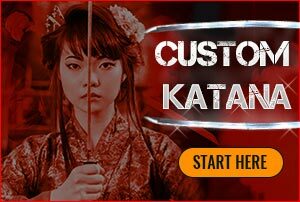 At Katanas for sale you can decide which fittings you want to use on your custom made Katana. Knowing that even the tiniest part and every inch of the sword is custom made makes all the difference. For high end swords we recommend choosing the high quality copper set of fittings which feature beautiful designs of animals, Samurai, Warriors, and lot more. 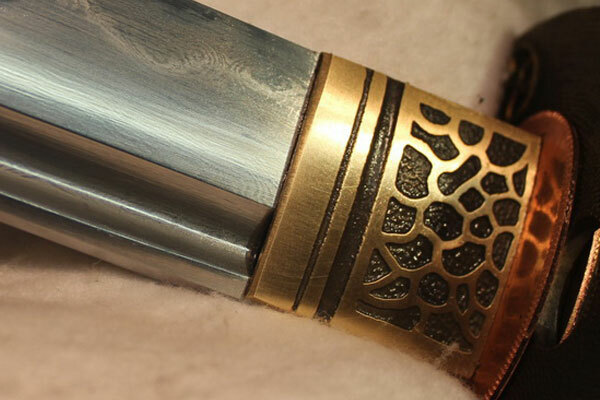 The fittings are made by top notch craftsman and worthy to decorate your sword with. If you would look closely at the details, you can truly appreciate the exquisite appearance that goes into each of this Fuchi and Kashira. Menuki are referred to as handle ornaments. 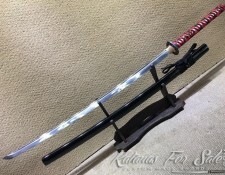 However, just as anything associated with this custom made Katana not everything is as it seems. 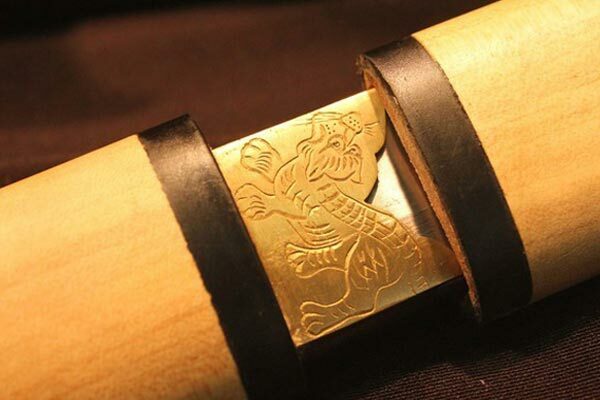 The Menuki usually sold in pairs and are placed on each side of the Tsuka. For practical purposes the Menuki is created to help you get a better grip of the handle since it fills the gap in the palm of the hands. Some schools do emphasize that its purpose is to ensure that the hand is properly placed. Originally the Menuki was meant to hide the Mekugi pegs. This is a peg that bolts the Tsuka to the Nakago, commonly made of bamboo, but can be made of copper or other materials. 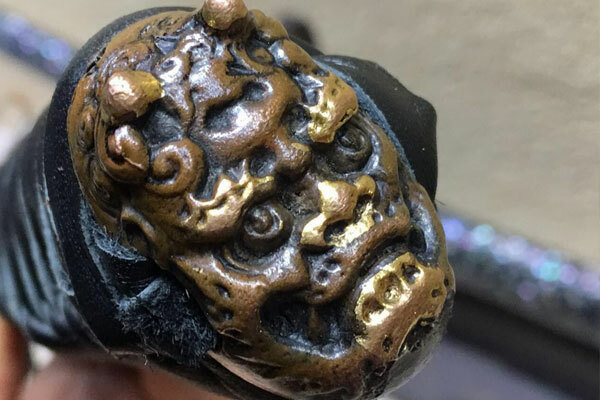 You can plan the design of the Menuki to work with a specific theme of fittings like dragons or tigers, or any other design you can find from our selection. We have several types of qualities available. 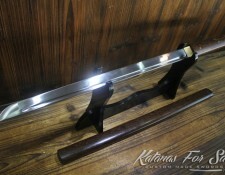 Habaki is a custom made wedged shaped metal collar that will keep the Samurai sword from falling out of its saya. A standard blade collar like this is normally made of brass or iron. 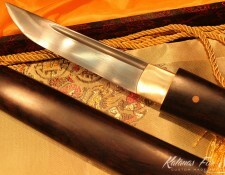 The Habaki makes the sword firm and sturdy and once it is fitted, the carbon steel Katana blade is ready for a handle. Seppa are washers positioned above and below the Tsuba they work to tighten the fittings. Katana sword has two Seppa. Some describes them as the spacers that hold the Tsuba on each side. The common materials use for Seppa can be bronze, brass or copper. 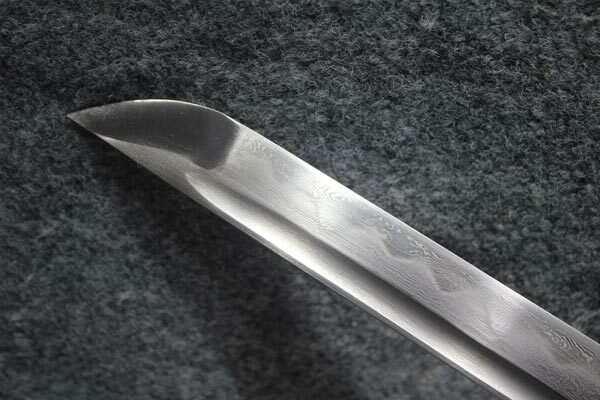 Seppa must fit well to ensure that the Tsuba will not loosen and the handle will remain as is. 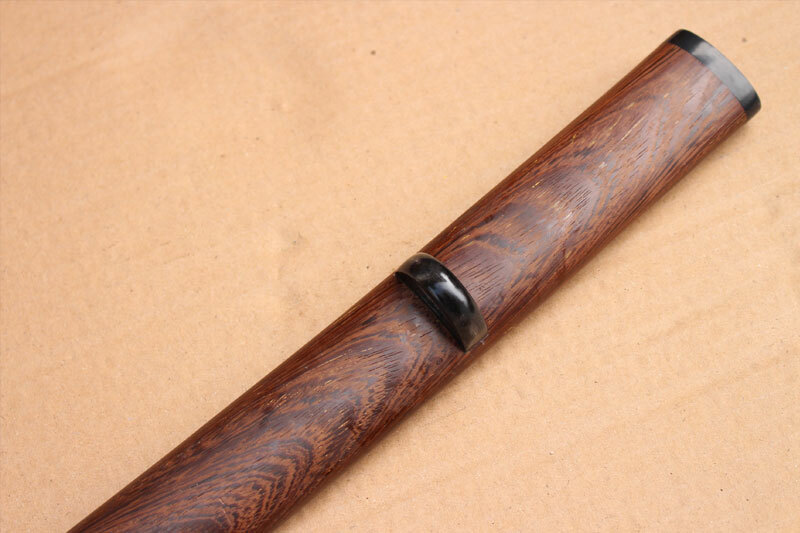 The Japanese term used for wrapping your handle is Tsukamaki. We offer two styles of wrapping, the traditional wrap (Tsumami-Maki) and battle wrap (Katate-Maki). The Ito can be made from leather or rayon silk in a variety of colors. Normally we match the color of the Sageo to the color of the Ito. 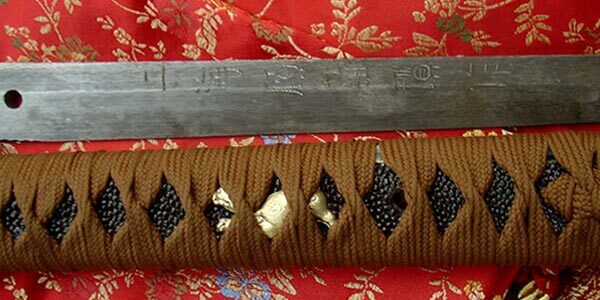 The Samegawa is the stingray skin fitted into the handle of the sword. The Japanese Samurai warrior used stingray skin on the hilt of the Katana sword for the primary reason that Samegawa provides a nonslip grip even if it was soaked in blood. 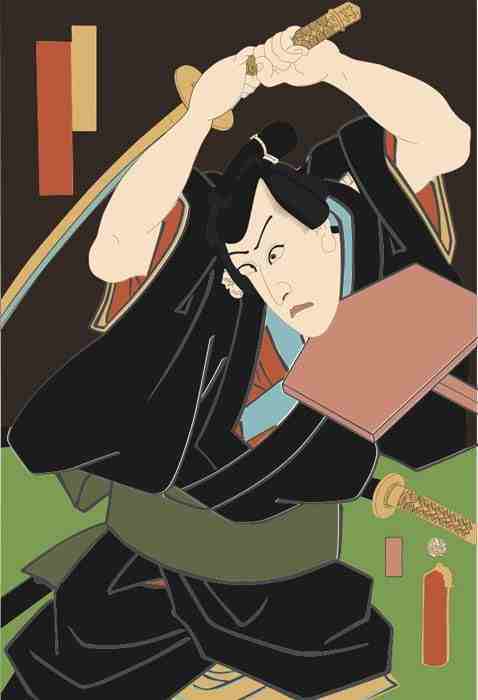 The saya is the sheath of the Samurai sword. It is traditionally made out of lacquered wood, and it’s main purpose is to protects the Katana blade when it is not in use. Removing the blade from the Saya like you see in the movies, without hurting yourself or damaging the saya, takes practice and skill. 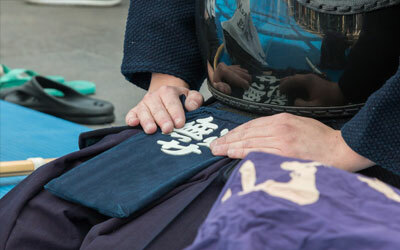 The fluid and graceful movement of drawing the sword and returning it back to the Saya is known as laido. 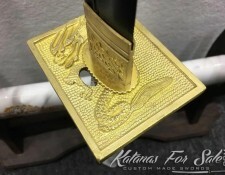 Sword engraving will ensure that your custom sword is unique and personalized for your taste. This opens up endless of possibilities, and you can engrave your favorite quotes, something meaningful and even an image. 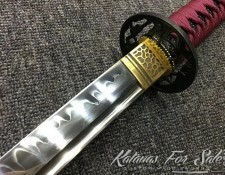 If you were looking for the perfect gifts for men, then engraving on your sword can make a big difference between a Katana, and custom Katana that was intended for the person you want to give it to. When using sword engraving, every inch of the custom Katana will become part of that personalization and evidence of beautiful craftsmanship. You can use any language you want for the engraving, if you prefer something written in English, Japanese Kanji or Chinese characters. 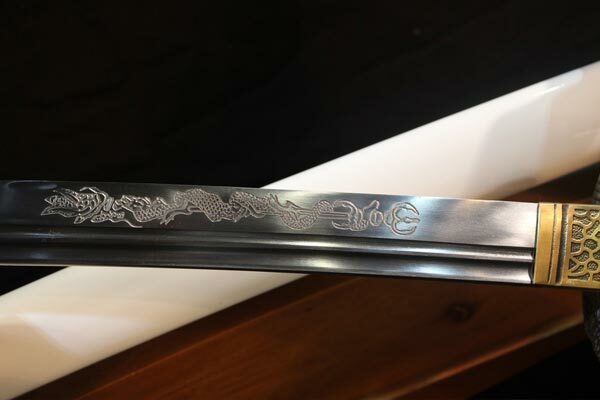 Sword engraving has managed to put thoughts and ideas into steel and use it to express an art work. Think of the sword as the craftsman canvass, Imagine owning a piece with something full of meaning, like your soul belongs in the sword. 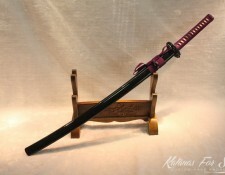 If you ever dreamt about this black blade Katana, then now you can have it. And you don’t have to limit yourself to black. 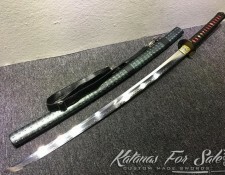 We offer several variations of blade colors for your custom Katana or any other Samurai sword or Ninja sword available on the site. The blade colors available depends on the type of steel you have chosen. 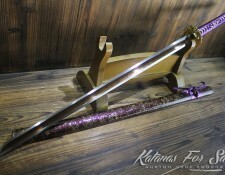 Folded Steel –Choose between Black & Red blade, and Purple sword blade. 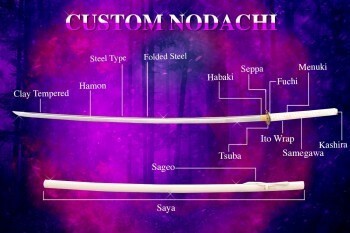 Non Folded Steel – Choose between Blue, Gold or Black blade Katana. The blade coloring is a natural acid dyeing method. Each color will give your sword unique look and will change the overall appearance. You can further enhance those with requesting polish for the blade. Remember that the process of selecting your blade is the very first step that you need to take in building your customized Katana and will affect the rest of your blade choices. Have you ever dream of making your martial art moves holding your own custom Katana in your hand? 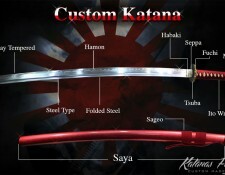 You can start now by making a choice on what type of custom sword you wish to purchase. Our recommendation for you is to choose higher quality blade that uses the traditional methods of clay tempering. 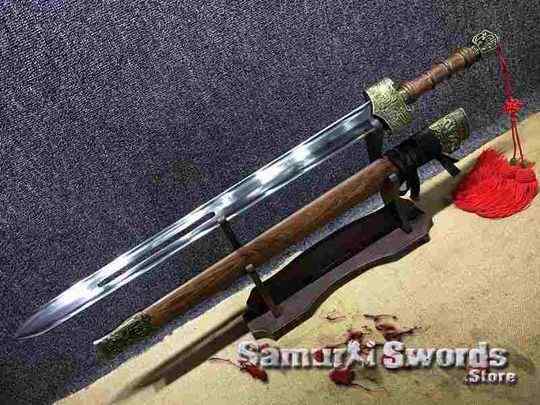 You can choose folded steel to further enhance the sword beauty and have the impressive texture of the thousands of steel layers on the sword. As a rule of thumb, the more complicated the techniques employed during the process of making the Katana blade. The more valuable the sword will be. 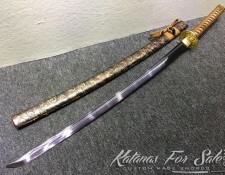 Suffice to say that these custom handmade Katanas are unique work of art where the craftsman love for what they are doing can be clearly seen in each of the swords that you will order. 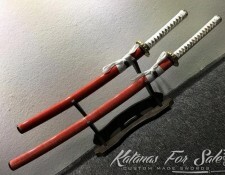 The amount of detail that goes into each of these custom made Katana is astounding. This is truly the best gift a man can have. 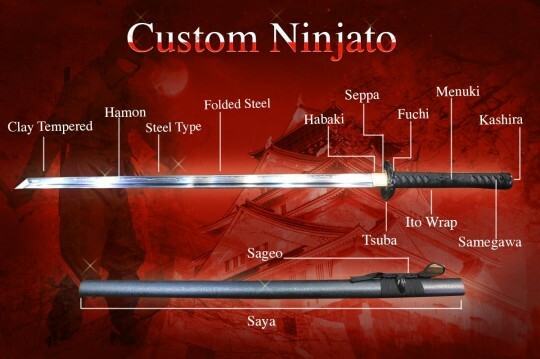 Especially with the possibility to further customize each sword to have unique personality based on the one who will own it. Our team of craftsmen will make it happen. If you have special requests, remember to be specific as much as possible when you contact us, so that we can better comply and provide you with the sword you are dreaming of. 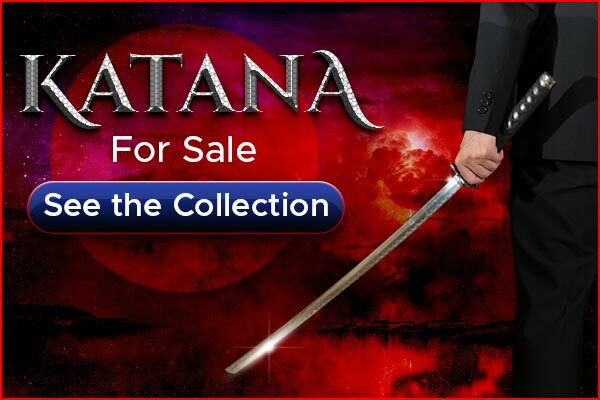 We want to ensure that you are getting not just a Katana but, something that you will treasure to own for the rest of your life. After all this symbolizes a prized possession that the average guy do not own. This highly valued blade will essentially live longer then you if properly treated and maintained. 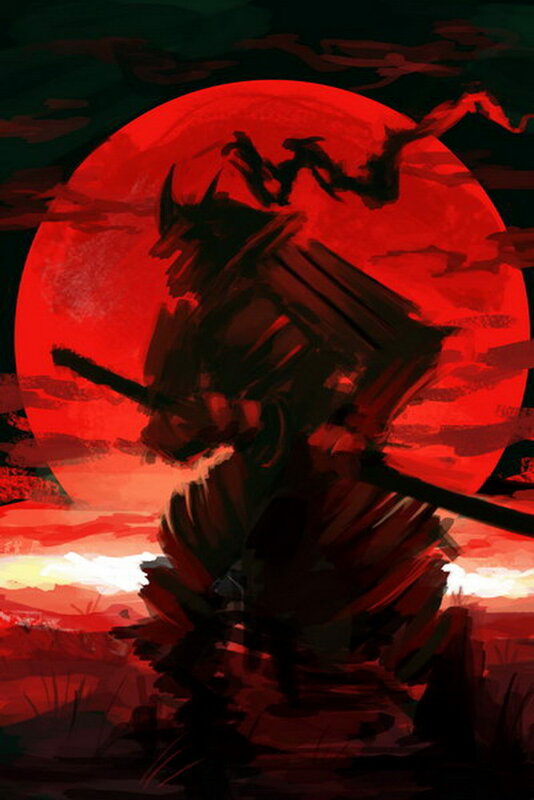 The Samurai regarded the Katana sword as an extension of his soul. That is how highly revered this Samurai sword is, especially to those that admire the technical excellence and other qualities that makes the Katana so special. For the new modern warriors, the Katana is a fitting blade to complement you and your lifestyle. The challenge now is upon you. Which Sword Will You Choose? 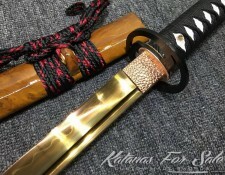 I chose and bought a Katana in T10 Clay Tempered on this site, are excellent, good quality, finishes and materials. The first quality, excellent service, I had no problems with shipping to my country Chile, I recommend. My wife, absolutely, loved this sword! Purple is her favorite color, and the way the handle is done is superb. My favorite part is how the blade is acid washed red, and it makes the Damascus steel, stand out. My custom 9260 spring steel nagamaki came in today, Andy couldn't be happier. All the fittings are snug and very attractive. The steel is tough, flexible and has a very nice polish on it. The customer service was excellent like other testimonials have said. When I requested a heavy niku sharpening they were quick to respond to inform me of what I requested, and double checked to make sure that's what I wanted. Shipping was very quick as well. If your in the market for a sword, please give these guys a shot and get their name out there. Good stuff fellas, keep it up. I ordered custom katanas for my groomsmen and I cannot say enough about the overall experience with this company. Tony helped me in selecting individual pieces for all 4 swords and was patient throughout the whole process. He had all of them complete and on my door step (Arizona) within a few weeks of ordering. These are incredibly well made and was truly a unique gift to present during my wedding and went over very well. Thank you again Tony and I'm sure we'll be talking soon on my next order! I've also recommended you to some of my guests from this weekend and they are excited to order some swords as well. I just wanted to say the katana is gorgeous and perfectly done. I WILL be purchasing from you again in the future! Great customer service with prompt shipping and great variety of customization options. Everything arrived great to the last detail, the white ray skin looked amazing complimenting my other sword. overall 5 star outstanding craftsmanship will definitely buy again. 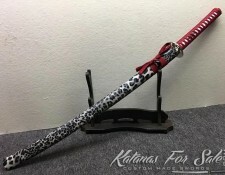 Just a note to let everyone know that the quality and service from katanasforsale cannot be duplicated. I recently ordered a Tanto and Box. the service and attention to detail could not be duplicated. Tony walked me through the process of putting together a custom Tanto which I love. his opinion and help made the process effortless. in the end I received a great masterpiece. a blade that I can display and be proud of. 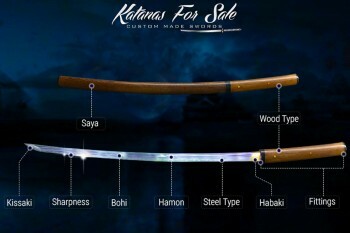 Katanasforsale is a company that I would highly recommend and would look foward to doing more business with again. a great experience.